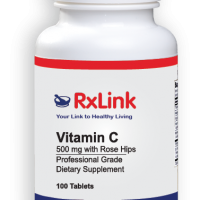 RxLink L-5-hydroxytryptophan (a.k.a. 5-HTP) is a naturally occurring amino acid and chemical precursor as well as a metabolic intermediate in the biosynthesis of the neurotransmitters, serotonin and melatonin, from tryptophan. Serotonin is a neurotransmitter found primarily in the gastrointestinal tract, platelets and central nervous system. Almost 90% of the human body’s total serotonin is located in the alimentary canal, where it is used to regulate peristalsis. In the central nervous system, neurons use serotonin to regulate various functions including mood, appetite, and sleep. In humans, serotonin levels are affected by diet, specifically carbohydrate intake and the amino acid, tryptophan. Increased intake of tryptophan or its metabolic intermediate, 5-HTP, may increase serotonin levels and help support healthy mood and appetite as well as sleep through its role in serotonin synthesis.RxLink Wellness Works 5-HTP extract is made under strict European quality standards, which are comparable to OverThe-Counter drug standards in the US. It provides optimal levels of naturally occurring L-5-hydroxytryptophan. Our formula is synergized with important nutrients like vitamin C and B-6, which aid the conversion of tryptophan to serotonin in the body. RxLink 5-HTP may be a useful dietary supplement for those who want to support healthy normal mood and sleep. Other Ingredients: Gelatin and water (capsules), (May contain one or more of the following: rice powder, silica and magnesium stearate). SUGGESTED USE As a dietary supplement, adults take 1 capsule daily with meals, or as directed by a healthcare professional. SIDE EFFECTS Warning: Not for use by children under 18 years. If pregnant or nursing, consult a physician before using this product. Do not use while operating a motorized vehicle or heavy machinery. Warning: Consult a physician before taking this product while using anti-depressants or MAO-inhibiting medications. REFERENCES Turner EH, Blackwell AD (2005). “5-Hydroxytryptophan plus SSRIs for interferon-induced depression: synergistic mechanisms for normalizing synaptic serotonin.” Medical Hypotheses 65 (1): 138–44. DOI:10.1016/j. mehy.2005.01.026. PMID 15893130. Birdsall TC (August 1998). “5-Hydroxytryptophan: a clinically-effective serotonin precursor”. Alternative Medicine Review: a Journal of Clinical Therapeutic 3 (4): 271–80. PMID 9727088. Retrieved 2009-07-30.